We talked a few weeks ago about why healthy, organic oils deserve to be added to your skincare routine, and with the weather quickly shifting from floral dresses to chunky knits, now’s a perfect time to find your go-to, daily moisturizer. But how do you pick and choose among the plethora of pure oils, oil infusions and oil blends? If you’re just venturing into the oil-as-a-moisturizer realm, it can be confusing and overwhelming to navigate. Much like finding that perfect, bold red lip color, finding the facial oil that’s best for your skin can be a journey. So, where to start? I suggest the Enhance Face Oil from Organic Bath Co.
Organic Bath Co.’s founders created the Enhance Face Oil to highlight and bring out your natural beauty. It’s for when you want your best skin to be revealed, glowing, clear and bright. Thankfully, any skin type can get this kind of beautiful skin with Enhance, partly because of its organic rosehip seed oil. Rosehip seed oil is considered a “dry” oil, meaning it quickly absorbs into skin, leaving no greasy residue. But its lightweight structure doesn’t mean it’s a lightweight in the moisturizing department: It’s actually a super hydrator that penetrates skin quickly, and is full of essential fatty acids that plump, repair and treat skin. It’s often used as an anti-aging ingredient because it helps treat wrinkles and skin damage with its vitamin C and lycopene. As if that weren’t enough, rosehip (combined with Enhance’s passionfruit oil) is also a great acne treatment—the same fatty acids that treat dry, dehydrated skin also pack a punch against blemishes. Plus, it’s anti-inflammatory and and antioxidant, so it soothes irritated skin and protects against environmental damage. Acai, blackberry, raspberry and cranberry seed oils: You’ve heard about eating berries for internal age-defying benefits, but putting the oils of these powerful antioxidants on your skin combats free radicals, which can directly impact visible signs of aging. Pomegranate seed oil, another ingredient that’s rich in fatty acids, helps promote skin cell regeneration, which heals wounds, clears acne and reverses signs of aging. Watermelon seed oil: Another amazing hydrator, watermelon seed oil is great for balancing oily or combination skin. The lightweight oil penetrates deeply, helping to dissolve excess sebum in pores and infusing skin with magnesium and zinc, both coveted blemish busters. Because of the rosehip and watermelon seed oil, the Enhance Face Oil has a silky, airy texture that you wouldn’t expect from such a moisturizing treatment. It melts into skin, leaving a light, glowy after effect (especially if you utilize the damp-skin technique that we talked about with body oils). This finish makes it great for day application, as it creates a perfect canvas for makeup application—healthy, hydrated and enhanced. Enhance’s light jasmine scent is one of my favorite parts of the oil. It’s soothing, calming and nourishing and makes me want to spend a few extra seconds giving my face a little massage before I start (or end) the day. With a two to three pump daily application, this bottle will last you about two and a half months, if not longer. I find that I use a little more (one and a half pumps) if I use it at night, and during the day, I only use one pump to get the moisture I need. Whether you’ve just stepped onto the natural beauty circuit or you’re a seasoned veteran, the Enhance Face Oil can benefit your skin. Its unique combination of organic oils provides just the right amount of moisture and skin-boosting ingredients to bring out your one-of-a-kind beauty, truly enhancing the lovely skin you’re in. 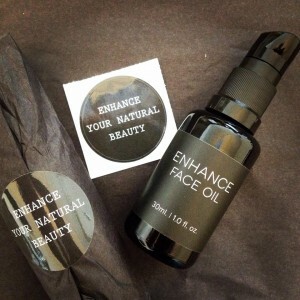 Have you tried the Enhance Face Oil? What types of oils are your favorites?